The president of our Young Women's group recently moved. She is such a wonderful person, so inspiring. All of the young women loved her and are really going to miss her. She had a great impact on them. I thought it would be fun to give her a little something to let her know how much we will miss her. The fabric I found totally reminds me of her style. I love the 50s look of it and the colors are gorgeous. It was fun to design the quilt and organize the squares. 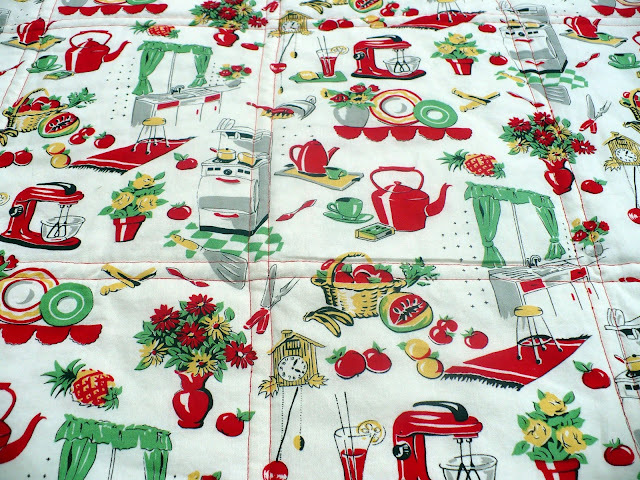 The fabric is from Michael Miller's 50's kitchen collection. I got mine from here. I had all of the girls write notes on paper, then I scanned them into the computer. I then flipped the image so it was backwards and resized them so they would fit within the squares. I printed them on this awesome paper. It was so easy to just iron it onto your squares. I ended up having to buy two different types of transfer paper. The squares that are circled below are from a different kind of paper. When I ironed them on it turned darker and less transparent. I hate how those few squares turned out. 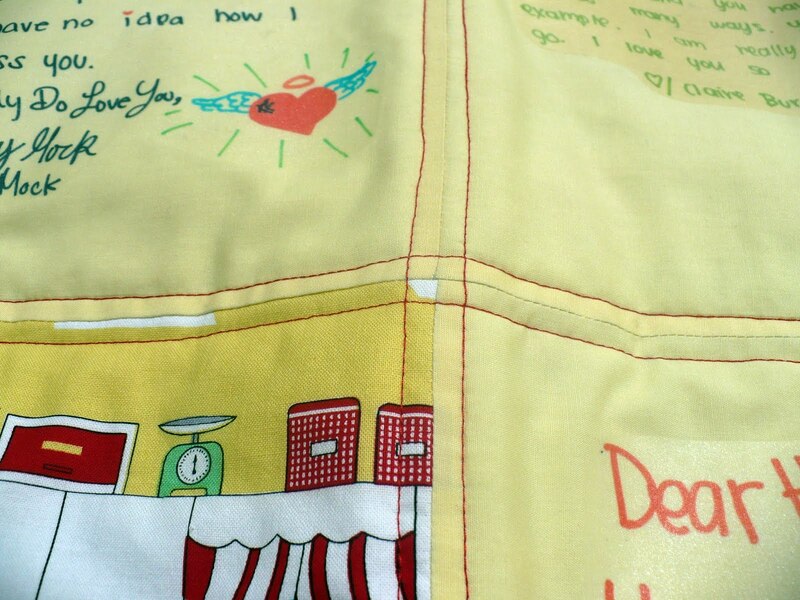 The transfer paper that I didn't like as much was The Next Style Fashion Art, Light Fabric Transfer. There are so many possibilities for this quilt. It could be a thank you to someone who has done a lot for you. 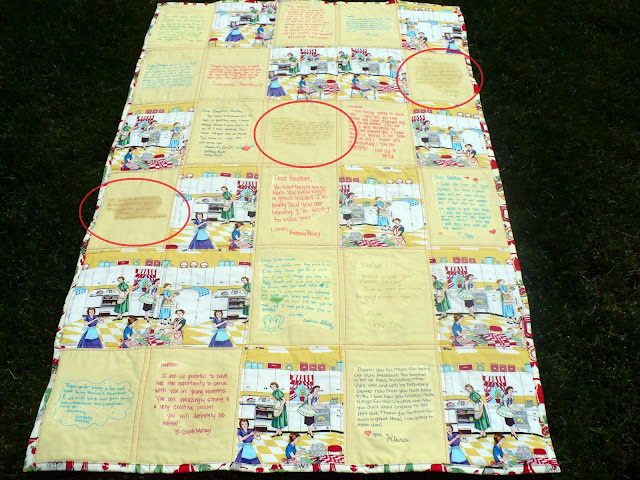 You could make a memory quilt or make one as a holiday gift. I am sure you can see the potential. Erica, seriously, adorable idea! I am in love with the fabric choice! I also like the idea of being able to manipulate the writing and then print it. You are right the options are endless! What was the kind of transfer paper that you DID like called? I think this is a great idea too, although truthfully I am way too lazy to make gifts this nice. Carlee- I used Avery brand. I really like most of their products. It is a little more expensive and you get one less sheet, but in the end I felt it was worth it.